Today on Birds and Booze, we’re going to be mixing our uppers and downers. Before you get too excited, relax: it’s only a coffee beer. 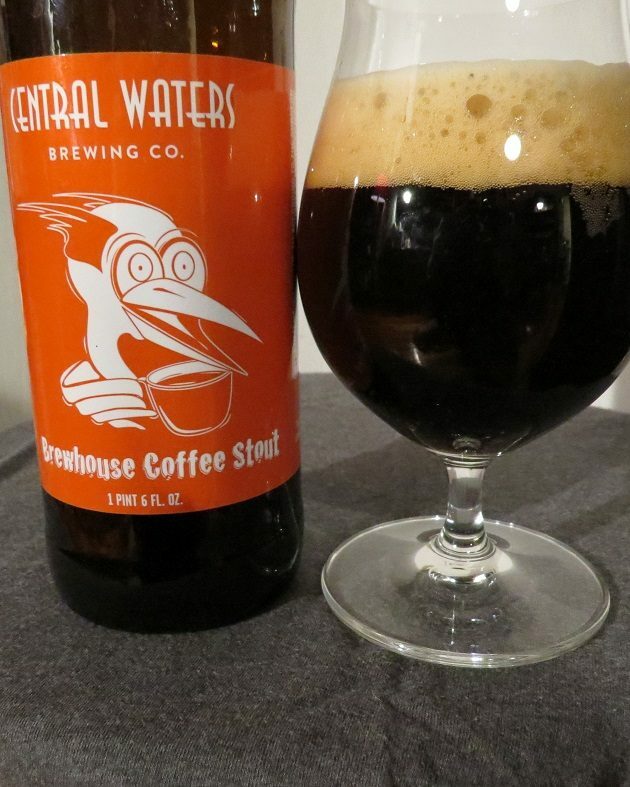 But it is a good one: Brewhouse Coffee Stout is a specialty release brewed by Central Waters Brewing Company of Amherst, Wisconsin using coffee roasted in-house by Emy J’s Coffee House and Café in nearby Stevens Point. Without assuming the worst of our readers and their chemical dependencies, I suspect coffee is probably a much bigger part of birding culture than alcohol. I know I can’t imagine being fully awake leaving the house before sunrise in May without that first rousing cup of joe. And getting through a long Christmas Bird Count, Big Day, or even a frigid winter morning looking for gulls without a big thermos of hot java – undoubtedly rolling around the passenger-side floor mat – is equally inconceivable. For the truly caffeinated birder, a long-distance chase may require several strategically-plotted gas station refills and doughnut shop pitstops – not to mention frequent bathroom breaks. But many of us enjoy both vices (in moderation, we hope), making a coffee beer the perfect choice for post-birding celebration and restoration (ahem). And yes – in case you were wondering – coffee beers do contain caffeine – something to consider before imbibing the night before you’re supposed to be at the marsh at 4:30 a.m. to listen for rails and bitterns. Of course, birders know that our worldwide addiction to coffee comes at a serious price: coffee production is responsible for a number of adverse ecological effects, including habitat destruction that is decimating wildlife populations in the tropics. Increasing global demand has caused many growers to take up so-called sun cultivation, a recently widespread method that has resulted in the disastrous clear-cutting of forests in the coffee belt of equatorial South America, Africa, and Asia. But some coffee farmers are adhering to the traditional practice of shade-grown cultivation, which leaves the forest canopy – and valuable avian habitats – intact (see Corey‘s excellent post about birding such a plantation). Thanks to efforts of the American Birding Association, the Smithsonian Migratory Bird Center, and other organizations, these products are labeled and increasingly available to consumers. If you care about birds and drink coffee, please buy bird-friendly, shade-grown coffee (and perhaps even consider limiting your consumption). Brewhouse Stout certainly looks the part of a coffee stout, with its dark, brown hues and a thick and foamy head resembling espresso crema. If you’re quick, you can catch a trace of dank, piney hops before they’re overwhelmed by the real reason we’re here: the deep, stimulating scent of full-bodied coffee. To that all-too-comforting aroma, this stout adds a mélange of complementary fragrances: malted milk powder, chocolate syrup, toasted hazelnuts, fruity notes of molasses and raisins, and a bit of dry, ashy char to keep the sweetness in check. Rich coffee flavors persist in the bittersweet but smooth palate, balanced by dark toffee sweetness, touches of vanilla and black cherry, with even more roast and some earthy hop bitterness in the long finish. Picking out an assortment of flavors in a complex beer like this is part of what makes drinking interesting, but mostly, Brewhouse Stout tastes satisfyingly of a good cup of coffee, just as it should. 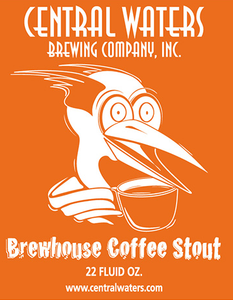 The Central Waters logo – a stately, graceful Great Blue Heron standing amidst the vast northern woods of Wisconsin – that adorns most of their beers is replaced on this bottle by a ridiculously perky cartoon bird wearing a winged helmet (a nod to Mercury or Wagner? ), leaving its identity anyone’s guess. 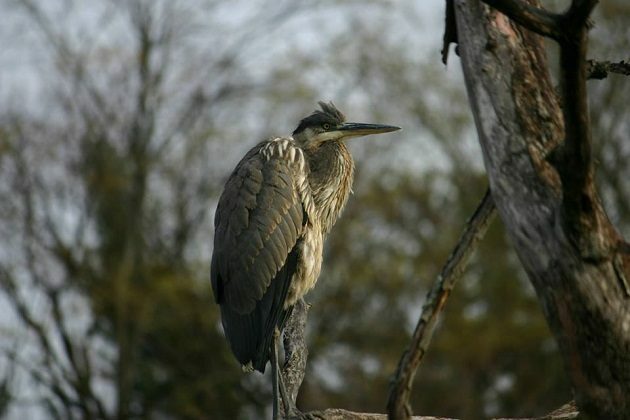 Could it be a Javan Pond-heron? A Capuchinbird? (Which, like a cappuccino, is named for its resemblance to the habits of that monastic order.) Or is it just a Common Buzzard?